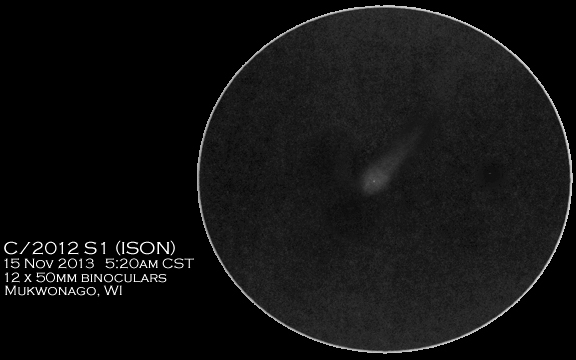 For my third day viewing comets before dawn, I got a special treat: ISON grew a tail! It started out not so well this morning. Up at 5am, I checked out the windows and saw nothing but clouds. Ugh. So I got dressed and headed out anyway, just to be sure there was nothing to see—and I’m glad I did, because the clouds were covering about 80-90% of the sky, but that little spot that wasn’t fully covered was centered over Virgo! There was only a slight breeze—nothing compared to yesterday. I guess it would be about 5-10 mph. Low enough that if it weren’t so cloudy, I would have pulled out the telescope, wind be damned. It was also the warmest it’s been in the past week at a balmy 35º. All in all, if the clouds weren’t there it would have been great! The downside was threefold: (1) the clouds were moving and moving in fast, so I only had about 10 minutes to gaze at the comet before it disappeared in haze. (2) I could look at nothing else—Lovejoy was just gone. (3) There were no other background stars viewable in the 12x50s so I can’t confirm what I saw in Stellarium, but I’m pretty darn sure it was ISON. The upside more than made of for that though: I got to see a comet three days in a row (well, not the same comet, but still…), and on top of the poor weather, I spotted ISONs tail! ← Got my second comet! I love astronomy and will use this blog to record my observations and share my experiences with family and friends. Special thanks to Attilla Danko!! Trying to do too much…I think. Follow Blog via Email, click here!